Mount Vernon experts will lead a set of two talks Saturday at 1 p.m. and 3 p.m.
After almost two years of restorations, the Chintz Room at George Washington's Mount Vernon estate reopened to the public Saturday. The redo came after Mount Vernon's architecture team discovered evidence that radically changed its understanding and interpretation of the second floor room, according to a release. Forensic analysis uncovered evidence for early repairs to the east wall that trapped a small fragment of the room's first, floral (known as "chintz") wallpaper. "The careful research carried out by Historic Preservation and Collections staff is breathing new life into this space," Mount Vernon Senior Vice President Carol B. Cadou said in a release. "This room will give visitors a real taste of the vibrancy of the late 18th century." The space has been previously known as the Nelly Custis Bedchamber, but documentary evidence shows that during the Washington's lifetime, the space was actually known as the Chintz Room, the release said. Curatorial staff discovered that the bed hangings were most likely those purchased by Washington in Philadelphia in 1774, made by Betsy Ross. Although few of the original furniture remains, the Washingtons' detailed records allowed curators to find accurate period objects to furnish the room. 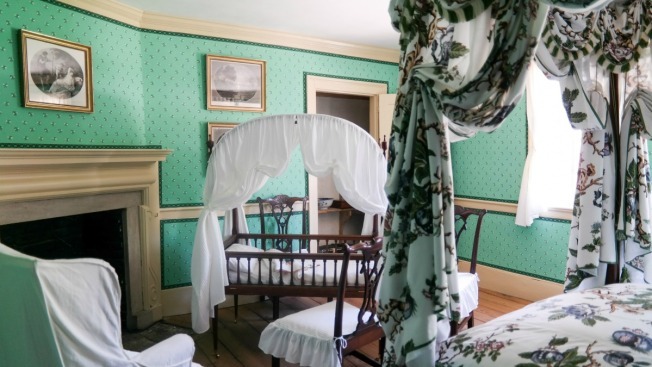 However, an original crib, gifted to Nelly Custis Lewis by Martha Washington in 1799, will return to the room.